After working for more than a decade on hover-capable drones no bigger than the palm of a hand, Dr. Moble Benedict and a team of researchers are studying the feasibility of scaling these concepts to larger unmanned aircraft (UAVs). Developing the next generation of UAVs requires revolutionary vehicle concepts that are compact, hover-efficient, high-speed capable, highly maneuverable with low acoustic-signatures and high gust tolerance. Benedict, a professor in the Department of Aerospace Engineering at Texas A&M University, and his team have been conducting pioneering research on these hover-capable Micro Aerial Vehicle (MAV) concepts for the Army, Navy and NASA, along with the University of Maryland. Through this research, Benedict hopes to develop the next generation of propulsion systems for large-scale UAVs. He believes that these propulsion systems may have some performance advantages in terms of efficiency, forward flight speed, agility and gust tolerance when compared to conventional helicopter rotors. So far, the key outcomes from this research are the development of the first flying cyclocopter, the only two-winged hover-capable flapping-wing aircraft in the 100-gram weight category, and successful demonstration of hover to forward flight transition of a 250-gram quad-biplane. These novel concepts have shown unprecedented performance over conventional helicopters at micro scales. 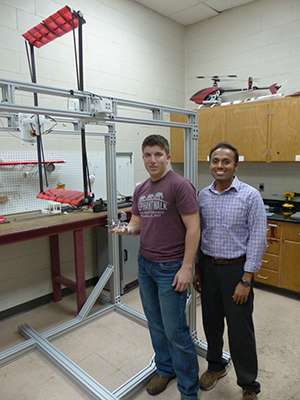 Research at Texas A&M will now focus on upscaling the cyclopcopter and flapping wing for larger vertical take-off and landing (VTOL) capable UAVs. Today, large-scale UAVs are used for intelligence, surveillance and reconnaissance types of missions, as well as carrying weapons systems and other large payloads. They also have civilian applications, such as aerial photography and potential package delivery. VTOL is highly desired for any of these applications. 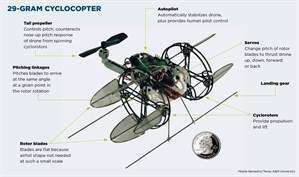 A cyclocopter uses a cycloidal rotor consisting of multiple airfoils rotating around a horizontal axis to generate lift and thrust. This makes it very maneuverable, able to transition from a stable hovering position to high-speed forward flight without needing to pitch itself forward like a helicopter. At small scales, cyclocopters are able to utilize available 3-D space, requiring a much smaller footprint than conventional helicopters, resulting in a highly compact flying vehicle. Adam Kellen, an aerospace graduate student on Benedict's team says, "Developing cutting edge VTOL UAVs requires engineers to consider alternative propulsion methods to combat poor flight time. The cycloidal rotors' ability to operate at high-pitch amplitudes without stalling among other aerodynamic phenomenon at micro scales are key to its performance and are the focus of the current UAV scale research." Benedict's team is looking at the feasibility of upscaling their cycloidal rotor to be used on larger VTOL UAVs weighing hundreds of pounds, and whether they would be viable in small manned aircraft. They are targeting test drones scaled up in size in the tens of pounds. They will be looking at how the vehicles perform as the scale increases, how they compare to helicopters and whether they become more efficient with scaling up. Biological flapping-wing flight offers superior maneuverability with excellent gust tolerance. Benedict's research will focus on understanding the underlying unsteady aeroelastic mechanisms present in flapping wings and how these would scale up with size. Benedict's goal is to understand why, in nature, only insects and the smallest of birds are capable of hover flight. The team will develop some aeroelastic scaling laws and conduct some benchtop experiments using a scaled-up flapper around four times the size of the wing used on their 60-gram robotic hummingbird. The goal is to measure the forces, wing shape and flowfield around the wing. This will help them understand the underlying physics on a scaled-up wing. Based on these results, they will decide whether it is worthwhile to build a scaled-up flapping-wing UAV. Scalability in both cases entails understanding how aerodynamics, structural mechanics, vehicle dynamics/stability/controllability and weight scales with size. State-of-the-art test rigs will be designed and built to measure the aeromechanics of dynamically scaled rotor/wing models in a range of various sizes. "If this study proves that these concepts are indeed scalable up to a manned aircraft, it could pave the way for the next generation of flying vehicles such as personal air vehicles, air taxis and more," Benedict says.